We are organising a recruitment day for healthcare professionals in Rome, Italy, on Tuesday 19th of March. We are recruiting Nurses and Radiologists for a German employer. The Nurses will work for the University Hospital in Freiburg RN in the operating theatre, intensive care units, normal wards and in the children's hospital. For more information about the working conditions and requirements, please check the vacancy for nurses and the vacancy for radiologists. 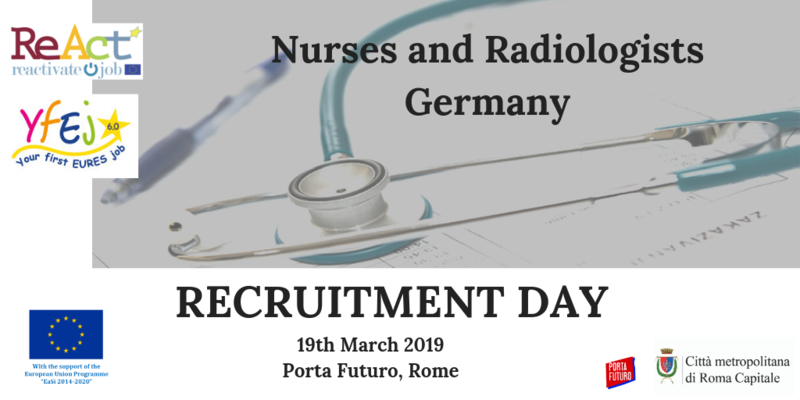 To participate in the recruitment day, you must register on YfEj Platform and send an email to jobmobility@cittametropolitanaroma.gov.it indicating “Recruitment day Nurses/Radiologists – Rome 19 March 2018” in the object. You will be given further information and instruction to complete the registration to the event.